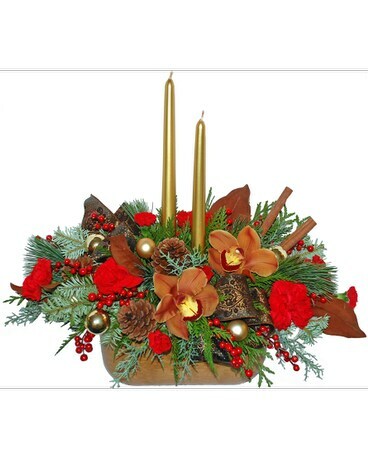 Our Helen Blakey Flowers original design, Winterlude, is a stunning holiday centerpiece. The dramatic cymbidium orchids are accented with luxurious ribbons, gold glass balls, red berry sprays, pine cones, fragrant evergreen bows, velvety brown dried magnolia leaves and a sprinkling of bright red carnations. Approx size; 40 cm W X 36 cm W. Brown bio pot.